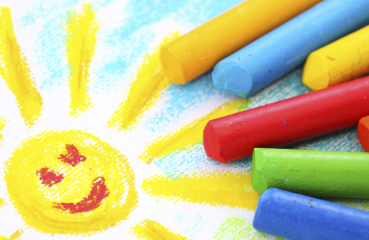 Big Plans for Little Kids is an Alberta Education approved non-profit organization. We provide early intervention services for preschool-aged children and are entirely funded by Alberta Education, so there are no additional costs for either the preschools or the preschool children's families whose child(ren) demonstrate a need. Children receive funding based on age, severity of needs, diagnosis(es) and how many hours per week the child attends a structured preschool program. Based on the child’s identified needs, a highly skilled and organized single- or multi-disciplinary team is brought together to support each child’s requirements. All of the services received by children and their families are funded by Alberta Education and therefore must be education-based. Each child works with an Early Learning Specialist (Certificated Teacher), whose primary role is to oversee the child’s Individual Program Plan (IPP). The Early Learning Specialist is responsible for coordinating the child’s team of therapists and observing the child's progress in the classroom, ensuring that the goals set out in the IPP are being reached. Depending on the severity of the child’s delay, they may be paired with an adult Child Development Facilitator (CDF), whose primary role is to assist the child in meeting his/her IPP goals in the classroom. The CDF is responsible for working with the child’s classroom teacher to ensure that the educational structure of the classroom assists in the development of the child’s learning abilities. The CDF also reports daily progress and results to the child’s Early Learning Specialists and parents. About 6% of children have difficulties with speech and language. When these difficulties persist into primary school, these children may have long-term problems with literacy, socialization, behaviour and school attainment, which can affect their ability to learn and interact with other children. 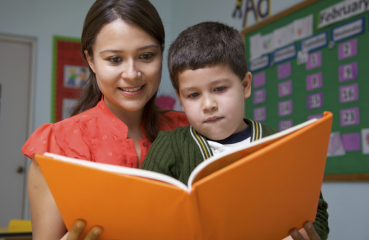 Speech and language intervention provides parents with strategies to help children minimize these difficulties so that they will succeed in an educational setting. Speech and language intervention typically occurs in an individual or small group setting. The primary goal of our program is to help children overcome these difficulties so that they can perform well in school and society. Reference: Law J, Garrett Z, Nye C. Speech and language therapy interventions for children with primary speech and language delay or disorder. Cochrane Database of Systematic Reviews 2003, Issue 3. Art. No. : CD004110. DOI: 10.1002/14651858.CD004110. It has been shown that moderate fine motor delays are correlated with self-care function, mobility, and social function. Delays in these areas can affect a child’s play and writing skills. Fine motor skill and functional development help improve the underlying sensorimotor foundations required for such activities. Occupational therapists can analyze and determine appropriate goals to assist the child in this development. Occupational therapy typically occurs in an individual or small group setting. The primary goal of our program is to help children develop these skills so that they can keep up with their peers in the classroom. Reference: Case-Smith, J. 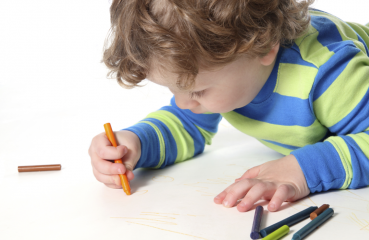 Fine motor outcomes in preschool children who receive Occupational Therapy services. The American Journal of Occupational Therapy. 1996, vol. 50 no.1 52-61. Gross motor delays can have an impact on speech development. Hypotonia can have an adverse effect on a child’s speech development and learning ability. Physical therapy can be used to strengthen muscle tone and help children improve their gross motor skills. Physical therapy typically occurs in an individual or small group setting. The primary goal of our program is to assist the child in the development of gross motor skills to enhance his/her development in speech and language. References: Gerdes, M., Solot, C., Wang, P., McDonald-McGinn, D. and Zackai, E. Taking advantage of early diagnosis: Preschool children with the 22q11.2 deletion. Genetics in Medicine. 2001. 3: 40-44. Ferry, P. PEDIATRICS.1981, Vol. 67, 1:38 -41. Most children develop normal sensory integration through routine exploration of the world, but some need extra help. A child may have difficulty planning and organizing actions, carrying out skilled movements, learning new tasks and unfamiliar movements, or maintaining appropriate attention levels for learning and interacting. When sensory integration is disordered, problems in learning, development, or behaviour may occur. Behavioural and/or psychological consultations identify any issues that may affect the child’s learning ability and/or interaction with his/her peers. Behavioural consultants and psychologists assist parents and teachers by providing strategies that can help the child succeed in the classroom as well as work with the families to help their child/sibling succeed in school and society. Consultations typically occur individually with the families, as well as in the classroom with the child’s peers. The primary goal of our program is to provide a better understanding of the child’s needs and to provide strategies that will help the child succeed in a structured educational program. Creating safe and caring environments for children from linguistically and culturally diverse backgrounds involves establishing a tone of respect. Children, parents and community members should feel as though they are welcomed members of the learning community and that their diverse identities are valued. Big Plans for Little Kids reflects a strong commitment to offering additional language instruction to help create opportunities for students and families to make choices about student learning experiences. This child is coded as either a Canadian born or foreign born first-language-speaker of a language OTHER THAN English. The funding is sourced from Alberta Education and is offered to children in their Jr. Kindergarten year (the year before entry into kindergarten). An Alberta Certificated Teacher must conduct formal ELL assessments to provide coding to this child. It is necessary that the program is complete and fully operational within the child’s educational setting. It is NOT necessarily therapy based; however, one-on-one focused practice and exposure to English in a structured and repetitive format has been proven to be one way of fostering improved second understanding and use. ELL therapy will address needs that have or may arise within the child’s structured educational setting and are mediated and addressed within the classroom through the certificated teacher involvement. Programming is formally tracked through the creation of an IPP document which is used to document and review the child’s mastery of new skills. To be eligible to receive any of the above funding types, the child must attend a preschool program that is approved by Alberta Licensing. 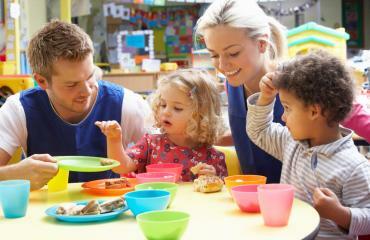 The Early Learning Specialist (Certificated Teacher) is required to keep attendance for every child receiving funding. An IPP must be created for every funded child, and these documents are both parts of our audit procedure. For more information about the ELL program and it's funding requirements, please refer to the Alberta Education website for more details. Big Plans for Little Kids also provides support for children and their families through Family Oriented Programming Sessions (FOPS). FOPS are individually planned and developmentally appropriate interventions for children with special education needs. Programs are designed to actively involve parent and/or caregivers in supporting the child's special education goals. FOPS facilitators work with families on strategies for how to meet a child's educational needs in the home and community. Family-oriented programming is individually planned, developmentally appropriate intervention for children with severe disabilities/delays and their families. It is designed to engage the child’s parent(s) in a process that helps them to implement the goals and objectives of the Individualized Program Plan (IPP) within the home and community environment. Family-oriented programming is implemented under the direction of a certificated teacher. This programming takes place outside of centre-based programming hours and is based on a 1:1:1 service delivery model where the child, parent, and member of the learning team from Big PLANS are all present and involved. We want to ensure that we involve our families in the process of planning for and implementing the Family-Oriented Programming Sessions. For this reason, we will need to gather your input on specific activities that will be important for your child and your family to be successful with so that you may participate fully as a family unit and also within your community. Family-Oriented Programming Sessions are 1 hour and 30 minutes in length. Based on the purpose of these sessions, they may be held at your home, the school or within your community. The following list will provide you with ideas of FOPS sessions that have taken place in the past. You and your family will generate a similar list of ideas for FOP sessions that you feel would be of great benefit to your family unit. Riding scooters to the convenience store and back to purchase an item. This list can be endless. Please start to fill in your tracking chart now! You will be reminded to look at filling this in for the rest of the year. Your Early Learning Specialists will remind you to bring your copy of the Tracking Form to the IPP meetings so that you can track the completed FOPS, the creation of new ideas, and ideas that are still in the works. The tracking form will also help the team of therapists know where they need to allocate their time across the year. Please click here for more information about FOPS click here.